The motley crew assembled inside the shady Oz Rock cafe, HQ de la Crow. A threatening sky did not deter the brave hashers to head into the dusky hood of the Stone, it was perhaps with some mild enthusiasm that they hit the trail. Runners headed West as the walkers obediently followed directions to the East. The walkers hit the Indian arrow within 100 yards and proceeded on instinct. Runners ran off into the dark as walkers continued in the runners invisible footsteps. Anticipating a Rambo and Whimps junction the walkers continued with slowly dissipating enthusiasm. What remained of their initial enthusiasm was thwarted by the look of an ominous hill on trail.All but the toughest turned around here; Tracka, GoneAgain and Ringo forged uphill with an indecisive Mable trailing behind. It was with great relief they stumbled upon the HHH before the true ascent took affect. GA armed with iPhone directions pointing to the most direct walking route to the buckets was overruled by Mable who cunningly led us back to the Oz Rock Inn with his built-in primate talent. 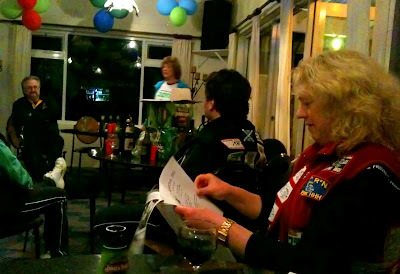 Raffle and Tucker were gratefully accepted, alcohol consumed, down downs swallowed with pride and we shall all meet again at BaldEagles abode next Monday night at 630pm 29 August 2011AD: 25 Torquay Road, East Devonport.